Hamilton, Bermuda, November 16, 2018. Nordic American Offshore Ltd (“NAO” or the “Company”) owns and operates a fleet of 10 Platform Supply Vessels (PSV) each averaging approximately 4,000 DWT and with an average age of about 5 years. Nine of the vessels are actively trading, primarily engaged in the North Sea offshore market between United Kingdom and Norway, while one vessel is still laid-up on the west coast of Norway. Results for the third quarter 2018 improved compared with the second quarter 2018. 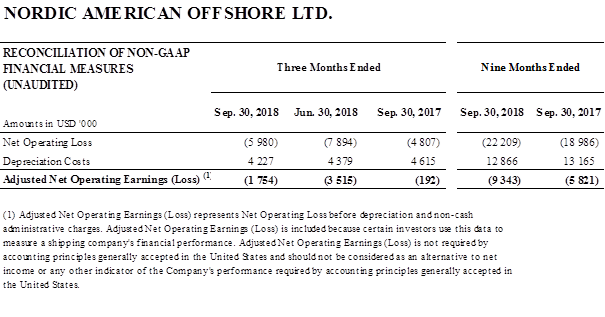 The Net Operating Loss was -$6.0m for 3Q18 compared with -$7.9m for 2Q18 (GAAP measure). The Adjusted Net Operating Result for 3Q18 was -$1.8m as compared to -$3.5m for 2Q2018. At the start of 3Q18 we faced a surplus of vessels re-introduced to the market, from lay-up conditions and from other regions. To secure utilization for our vessels we shifted from having no vessels on term charters in July, to having five vessels on shorter term contracts towards the end of the quarter. Also, at the end of the quarter the weather helped tighten availability and pushed rates up. This helped making the third quarter the best quarter in 2018 and September the best month. Most of the lay-up fleet that was considered easy to activate, has now been activated and as such, there is a greater barrier on the supply-side, meaning that rates would need to see a substantial uplift for the remaining units to be reactivated. On the demand side, we see increased E&P spending globally and in the North Sea specifically, with the most notable being the development of the Johan Sverdrup field. This is the fifth largest oil discovery in the history of the Oil&Gas industry in the North Sea. The development of this Giant field and other projects, along with increased exploration activity will undoubtably have positive effects on demand for Offshore Supply vessels in the North Sea going forward. The market may turn quickly and unexpectedly. We concentrate on keeping our vessel operating costs low, while always maintaining our strong commitment to safe operations. Resent inspections confirm the excellent technical condition of our fleet. As we expand our fleet, we do not anticipate that our administrative costs will rise correspondingly. The basic features of NAO are similar to the business model of the NYSE listed tanker company Nordic American Tankers Limited (“NAT”). NAT holds 16.1% of NAO’s common shares. 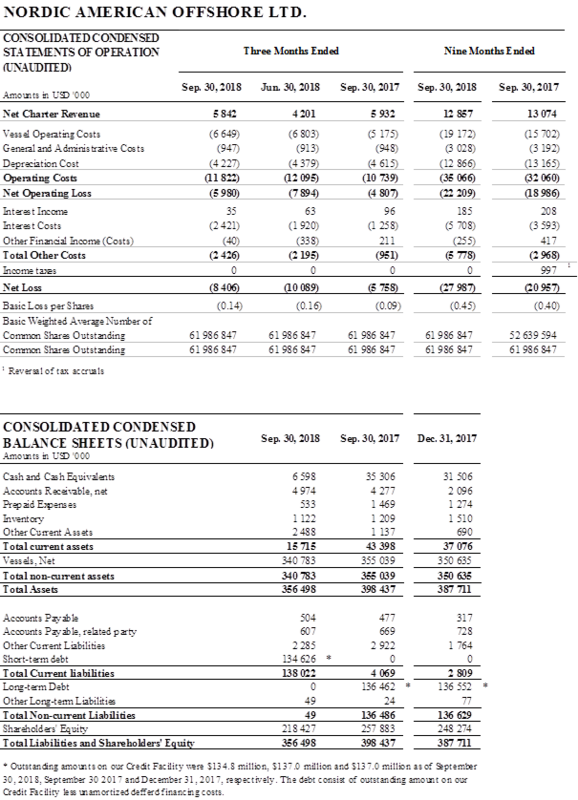 The Executive Chairman of NAO and his immediate family hold 13.4% of NAO’s common shares. He is also the Chairman & CEO of NAT. The weak offshore supply market has put a strain on our cash liquidity. We are working on a concrete arrangement that we expect will contribute to the short-term liquidity need. We pursue a conservative financial strategy, having little or no debt. This is also our plan going forward. At the end of 3Q18, the net debt per vessel was $12.2 million. At the end of the quarter our fleet’s market valuation (steel value) was in breach with certain covenants under our Revolving Credit Facility. Therefore, we classify the debt as current. We expect this matter to be solved in early 2019 at the latest. As for the contemplated canadian Horizon Maritime business combination, due dilligence processes are still ongoing. For further details on our financial position, please see the financial information reported below and this entire release. The main elements of NAO’s strategy are based on a homogenous fleet, low debt, low G&A costs and liquidity in the stock. NAO has about 35,000 shareholders, mostly in the USA. Under improved market conditions dividend is a priority. NAO is committed to protecting its underlying earnings. We shall endeavor to safeguard and further strengthen NAO’s position in a deliberate, predictable and transparent way. We encourage investors interested in the offshore sector to consider buying shares in NAO. It is expected that the cash position of NAO should be improved by the concrete plans we have in hand. The Company desires to take advantage of the safe harbor provisions of the Private Securities Litigation Reform Act of 1995 and is including this cautionary statement in connection with this safe harbor legislation. The words “believe,” “anticipate,” “intend,” “estimate,” “forecast,” “project,” “plan,” “potential,” “may,” “should,” “expect,” “pending” and similar expressions identify forward-looking statements. Adjusted Net Operating Result represents Net Operating Result before depreciation and non-cash administrative charges. Net debt is working capital less long term debt, divided by 10 vessels. 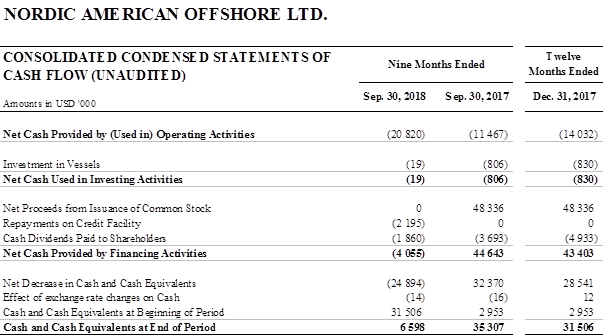 Nordic American Offshore Ltd. Announces Agreement to Further Extend Waiver Period.